Happy Vesak - People all over the world hope our Raj Bhavan, Parliament, Rajya Sabha, The White House, and all our Media celebrate Buddha Jayanthi in a grand manner for the Welfare, Happiness and Peace of the entire people. beautiful rendition of his teaching on Loving-Kindness, the Metta Sutta. The figure is the Kassapa Buddha, one of four Buddhas in the Ananda Temple, Bagan, Myanmar. with the temple and this figure of the Buddha, eight hundred years ago. The left hand and centre photos are from the brilliant travel blog of Forrestwalker. beautiful, here’s the whole thing. Eddy hopes to use his pictures to support a hill village school in Myanmar. Province, The Kingdom of Thailand. Buddhajayanti: The Celebration of 2600 Years of the Buddha’s Enlightenment. 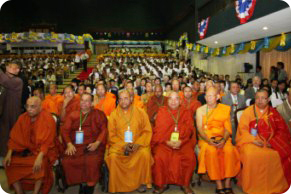 Participants : 5,000 Buddhist leaders, scholars, delegates and observers from all over the world are expected to attend the conference. 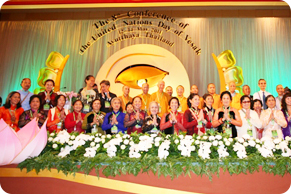 Participants : Over 2,000 Buddhist leaders, scholars and delegates from all over the world are expected to attend the conference. Nakhon Pathom Province, The Kingdom of Thailand. 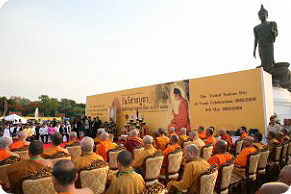 institutions and in promoting and sharing Dhamma resources. 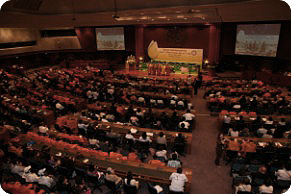 Conference Centre in Bangkok, The Kingdom of Thailand. 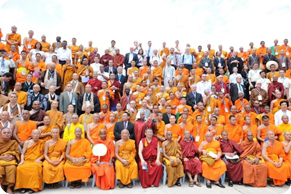 Participants : Over 2000 Buddhist leaders, scholars and delegates from all over the world are expected to attend the conference. King Bhumibol Adulyadej’s 80th Birthday Anniversary. and the sufficiency-economy theories of H.M.King Bhumibol. at Maha Bodhi Society, 14, Kalidasa Road, Gandhinagar, Bangalore-560009. Founder President, Maha Bodhi Society, Bangalore. the invitation of the Nāga King Maniakkhika (Mahavamsa i,72ff.). by completely perfect and utterly unsurpassable self-Enlightenment! itself! Seeing this miracle, she knew something special was happening! offered the cooked milk rice into the hands of this Great Being. have planted themselves! This is the place for destroying this net of desire! Then the Future Buddha turned his back to the trunk and thus faced east. 10 perfections to the third degree, nor have you given the 5 great donations. the sun had set that the Tathagata conquered Mara and defeated his army. But the satisfaction that arose here did neither invade my mind, nor remain. Such is the Way leading to the end of mental fermentation. is such endless birth, ageing, decay, sickness and ever repeated death! come to a happy end… Nibbāna is verily the Highest Bliss! The Jātaka Nidāna. The story of Gotama Buddha. Tr. by N.A. Jayawickrama, Pali Text Society 1990. Happy Vesak to All Beings! Hope things are fine at religious, political and home fronts. I appreciate and acknowledge receipt of your recent valuable Mails. out of so you had been sending meticulously. - 3d street pictures- Hats off to the artist for his brilliance. on the eve of Budha Poornima. • New voter verifiable paper trail (VVPT) machines to replace the EVMs, following doubts that it could be tampered.Voting Machines are “Calculators which can be manipulated by computer softwares”. New Machines are ordered by EC, where a paper slip will come out with EVM voting which will be then deposited in a box. What is the use? Paper Slip will show that voter has casted vote for “Party A”, but calculator software will add vote to “Party B”! The Computers are programmable. No use for such fake paper slips. In Superior Courts it has been demonstrated how these computers can be manipulated and how it can be pre-programmed to make sure victory to one candidate during election. The EVM machines have killed Democracy and have all the potentials to do so. The ruling castes are manipulating EVMs to make sure victory to them depriving the dipressed classes to enable them to acquire the MASTER KEY that can unlock all doors of progress to the entire people. • Under such circumstances the following exposure by media had no relevance during the last Karnataka Assembly Elections 2013 where the Congress won and the trend will continue in the forth coming General Elections until the Superior Court and the upholders of Democracy including the free and fair media. The larger information technology and services sector has seen a substantial growth in business activity directly or indirectly tied to open source software. Is disclosed and open source software something that would naturally arise in the voting systems market? The voting technology market and regulatory environment are sufficiently distinct that a direct translation of current open source business models is questionable. Here, we cover what business models from other open source business endeavors might be applicable in the voting systems market. In Section , we highlight some barriers to entry and ongoing business that such an enterprise might face. Some ways that companies use to make money off of open source do not translate well to the voting systems market. For example, Google’s business strategy involves running optimized web search services on server clusters running the Linux operating system. Given the concerns and problems with networking in election systems, it would be difficult for a company to make money off of running open source voting software remotely. IBM sells proprietary software that works on top of or in concert with open source software. A company that tried to do this in the voting market would have to marshal each version of its software package through certification, and then it would only be partially open as a whole. Ime kho panàyasmanto sekhiyà dhammà uddesaü àgacchanti. Supañicchanno antaraghare gamissàmã-ti, sikkhà karaõãyà. Supañicchanno antaraghare nisãdissàmã-ti, sikkhà karaõãyà. Susaüvuto antaraghare gamissàmã-ti, sikkhà karaõãyà. Susaüvuto antaraghare nisãdissàmã-ti, sikkhà karaõãyà. Okkhittacakkhu antaraghare gamissàmã-ti, sikkhà karaõãyà. Okkhittacakkhu antaraghare nisãdissàmã-ti, sikkhà karaõãyà. Na ukkhittakàya antaraghare gamissàmã-ti, sikkhà karaõãyà. Na ukkhittakàya antaraghare nisãdissàmã-ti, sikkhà karaõãyà. Na ujjagghikàya antaraghare gamissàmã-ti, sikkhà karaõãyà. Na ujjagghikàya antaraghare nisãdissàmã-ti, sikkhà karaõãyà. Appasaddo antaraghare gamissàmã-ti, sikkhà karaõãyà. Appasaddo antaraghare nisãdissàmã-ti, sikkhà karaõãyà. Na kàyappacàlakaü antaraghare gamissàmã-ti, sikkhà karaõãyà. Na kàyappacàlakaü antaraghare nisãdissàmã-ti, sikkhà karaõãyà. Na bàhuppacàlakaü antaraghare gamissàmã-ti, sikkhà karaõãyà. Na bàhuppacàlakaü antaraghare nisãdissàmã-ti, sikkhà karaõãyà. Na sãsappacàlakaü antaraghare gamissàmã-ti, sikkhà karaõãyà. Na sãsappacàlakaü antaraghare nisãdissàmã-ti, sikkhà karaõãyà. Na khambhakato antaraghare gamissàmã-ti, sikkhà karaõãyà. Na khambhakato antaraghare nisãdissàmã-ti, sikkhà karaõãyà. Na oguõñhito antaraghare gamissàmã-ti, sikkhà karaõãyà. Na oguõñhito antaraghare nisãdissàmã-ti, sikkhà karaõãyà. Na ukkuñikàya antaraghare gamissàmã-ti, sikkhà karaõãyà. Na pallatthikàya antaraghare nisãdissàmã-ti, sikkhà karaõãyà. Sakkaccaü piõóapàtaü pañiggahessàmã-ti, sikkhà karaõãyà. Pattasa¤¤ã piõóapàtaü pañiggahessàmã-ti, sikkhà karaõãyà. Samasåpakaü piõóapàtaü pañiggahessàmã-ti, sikkhà karaõãyà. Samatittikaü piõóapàtaü pañiggahessàmã-ti, sikkhà karaõãyà. Sakkaccaü piõóapàtaü bhu¤jissàmã-ti, sikkhà karaõãyà. Pattasa¤¤ã piõóapàtaü bhu¤jissàmã-ti, sikkhà karaõãyà. Sapadànaü piõóapàtaü bhu¤jissàmã-ti, sikkhà karaõãyà. Samasåpakaü piõóapàtaü bhu¤jissàmã-ti, sikkhà karaõãyà. Na thåpato 32 omadditvà piõóapàtaü bhu¤jissàmã-ti, sikkhà karaõãyà. Na såpaü và bya¤janaü và odanena pañicchàdessàmi bhãyokamyataü 33 upàdàyàti, sikkhà karaõãyà. Na såpaü và odanaü và agilàno attano atthàya vi¤¤àpetvà bhu¤jissàmã-ti, sikkhà karaõãyà. Na ujjhànasa¤¤ã paresaü pattaü olokessàmã-ti, sikkhà karaõãyà. Nàtimahantaü kabaëaü karissàmã-ti, sikkhà karaõãyà. Parimaõóalaü àlopaü karissàmã-ti, sikkhà karaõãyà. Na anàhañe kabaëe mukhadvàraü vivarissàmã-ti, sikkhà karaõãyà. Na bhu¤jamàno sabbaü hatthaü mukhe pakkhipissàmã-ti, sikkhà karaõãyà. Na sakabaëena mukhena byàharissàmã-ti, sikkhà karaõãyà. Na piõóukkhepakaü bhu¤jissàmã-ti, sikkhà karaõãyà. Na kabaëàvacchedakaü bhu¤jissàmã-ti, sikkhà karaõãyà. Na avagaõóakàrakaü bhu¤jissàmã-ti, sikkhà karaõãyà. Na hatthaniddhunakaü bhu¤jissàmã-ti, 34 sikkhà karaõãyà. Na sitthàvakàrakaü bhu¤jissàmã-ti, sikkhà karaõãyà. Na jivhànicchàrakaü bhu¤jissàmã-ti, sikkhà karaõãyà. Na capucapukàrakaü bhu¤jissàmã-ti, sikkhà karaõãyà. Na surusurukàrakaü bhu¤jissàmã-ti, sikkhà karaõãyà. Na hatthanillehakaü bhu¤jissàmã-ti, sikkhà karaõãyà. Na pattanillehakaü bhu¤jissàmã-ti, 35 sikkhà karaõãyà. Na oññhanillehakaü bhu¤jissàmã-ti, sikkhà karaõãyà. Na sàmisena hatthena pànãyathàlakaü pañiggahessàmã-ti, sikkhà karaõãyà. Na sasitthakaü pattadhovanaü antaraghare chaóóessàmã-ti, sikkhà karaõãyà. Na chattapàõissa agilànassa dhammaü desissàmã-ti, 36 sikkhà karaõãyà. Na daõóapàõissa agilànassa dhammaü desissàmã-ti, sikkhà karaõãyà. Na satthapàõissa agilànassa dhammaü desissàmã-ti, sikkhà karaõãyà. Na àyudhapàõissa agilànassa dhammaü desissàmã-ti, sikkhà karaõãyà. Na pàdukàråëhassa agilànassa dhammaü desissàmã-ti, sikkhà karaõãyà. Na upàhanàråëhassa agilànassa dhammaü desissàmã-ti, sikkhà karaõãyà. Na yànagatassa agilànassa dhammaü desissàmã-ti, sikkhà karaõãyà. Na sayanagatassa agilànassa dhammaü desissàmã-ti, sikkhà karaõãyà. Na pallatthikàya nisinnassa agilànassa dhammaü desissàmã-ti, sikkhà karaõãyà. Na veñhitasãsassa agilànassa dhammaü desissàmã-ti, sikkhà karaõãyà. Na oguõñhitasãsassa agilànassa dhammaü desissàmã-ti, sikkhà karaõãyà. Na chamàya nisãditvà àsane nisinnassa agilànassa dhammaü desissàmã-ti, sikkhà karaõãyà. Na nãce àsane nisãditvà ucce àsane nisinnassa agilànassa dhammaü desissàmã-ti, sikkhà karaõãyà. Na ñhito nisinnassa agilànassa dhammaü desissàmã-ti, sikkhà karaõãyà. Na pacchato gacchanto purato gacchantassa agilànassa dhammaü desissàmã-ti, sikkhà karaõãyà. Na uppathena gacchanto pathena gacchantassa agilànassa dhammaü desissàmã-ti, sikkhà karaõãyà. Na ñhito agilàno uccàraü và passàvaü và karissàmã-ti, sikkhà karaõãyà. Na harite agilàno uccàraü và passàvaü và kheëaü và karissàmã-ti, sikkhà karaõãyà. Na udake agilàno uccàraü và passàvaü và kheëaü và karissàmã-ti, sikkhà karaõãyà. Uddiññhà kho àyasmanto sekhiyà dhammà. Parisuddhetthàyasmanto, tasmà tuõhã, evam-etaü dhàrayàmi. Ime kho panàyasmanto satta adhikaraõasamathà dhammà uddesaü àgacchanti. Uddiññhà kho àyasmanto satta adhikaraõasamathà dhammà. 29 Editor’s note: BJT omits this title by mistake. The Pàñidesanãya rules are listed only as Pañhama-, Dutiya-, etc. there being no distinctive titles for these training rules either in BJT or ChS. 31 Editor’s note: BJT has no distinctive titles for the Sekhiya training rules, they are listed there as Pañhama-, Dutiya-, etc. up to Dasama-, after which they start again with Pañhama-. title for the second rule is given. 32 BJT note: Thåpakato - ChS. 33 Editor’s note: BJT, Bhãyyokamyataü, but it’s normal practice is to write these forms as bhãyo- etc. 34 Editor’s note: BJT, bhu¤jissàmi-ti, printer’s error. 35 Editor’s note: BJT, bhå¤jissàmã-ti, printer’s error. 36 Editor’s note: BJT, desessàmi-ti, here but desissàmã-ti elsewhere. Nirvana, and passing (Parinirvana) of Gautama Buddha. When Is Vesak 2013 / Wesak 2013? which is the 15th day in the 4th month of Chinese lunar calendar. 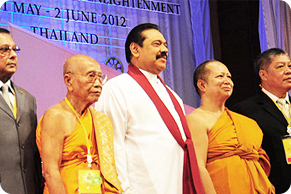 However, some countries observes the Vesak Day 2013 on different dates. different date for this festival, many would fall on the same day. Thus the date varies from year to year, but as general consensus in many countries, falls on the full-month day in May. 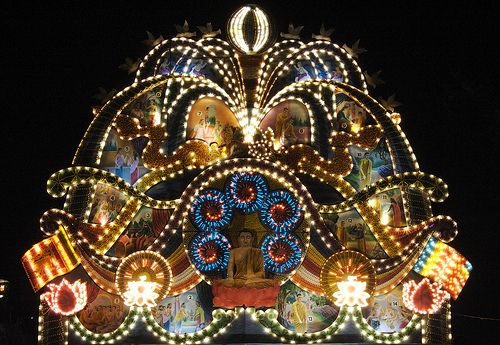 Vesak Day is often referred to with other names in each country. Vesak or Wesak (???) in the Sinhalese language. * ?? (Mandarin: Fódàn, Cantonese: F?tdàahn) in Chinese-speaking communities in China, Singapore, Taiwan. The Vesak Day is an extremely important occasion observed in Singapore. Bukit Merah and Lian Shan Shuang Lin Temple at Jalan Toa Payoh. 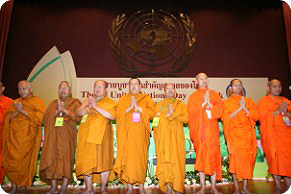 Hari Waisak celebrations in Indonesia generally follows the decision of The World Fellowship of Buddhists. complex of Borobudur Temple in Central Java. and torch ignition with the eternal flame of Mrapen, Grobogan County. full moon can also occur during the daytime. Besides the three main ceremonies, other Waisak ceremonies that were also conducted are pradaksina, parades, and art events. 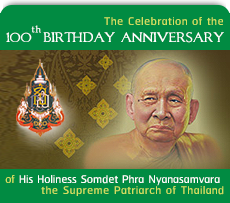 be celebrated on Friday, 24 May 2013.
took place on the same lunar date. symbolic gesture of releasing the soul and giving up the past sins. freedom for those that are held against their will or being tortured. Free meals are also given to the needy on the Wesak Day. May 2013 to Saturday, 25 May 2013.
and animals are released in huge numbers. 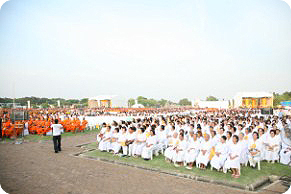 Celebrations include various religious and alms giving activities. Katha or the 550 Past Life Stories of the Buddha. all parts of the country during this week. celebrated on Saturday, 25 May 2013 in India. Buddha a bowl of milk porridge. teachings), and The Sangha (his disciples). burn out in short time, our life span is too short and will decay soon. Buddha and urge people to respect other religions. in Japan, 2013 Vesak Day will be celebrated on Monday, 8 April 2013.
made out of the day in some areas. with candlelit processions often taking place once night has fallen. sutra, as something like a service. The usual dress is pure white. austerity. This event was one major link in his enlightenment. girl named Sujata placed a bowl of milk in front of him as an offering. from harming his own body. sutras and confession and prayer) is practiced by monks. freed to symbolize humanity and compassion. symbolizes a fresh start in life and the care given to newborn babies. by using fragrant water to bathe the image of Buddha. 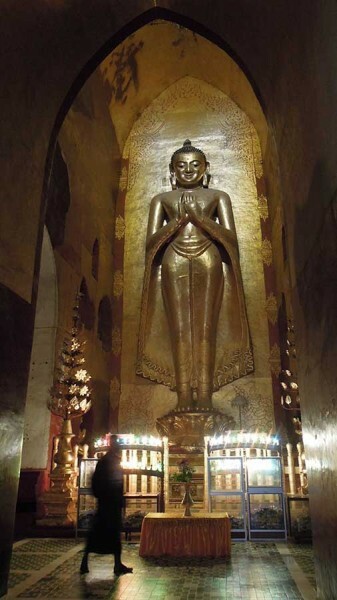 in 2012, the Buddha birthday falls on Friday, 17 May 2013.
visitors. The breakfast and lunch provided are often sanchae bibimbap. In 2013, South Korea will celebrate the Buddha Birthday on Friday, 17 May 2013. Happy Wesak 2013 ! Happy Vesak 2013 ! New voter verifiable paper trail (VVPT) machines to replace the EVMs, following doubts that it could be tampered.Voting Machines are “Calculators which can be manipulated by computer softwares”. New Machines are ordered by EC, where a paper slip will come out with EVM voting which will be then deposited in a box. What is the use? Paper Slip will show that voter has casted vote for “Party A”, but calculator software will add vote to “Party B”! The Computers are programmable. No use for such fake paper slips. In Superior Courts it has been demonstrated how these computers can be manipulated and how it can be pre-programmed to make sure victory to one candidate during election. The EVM machines have killed Democracy and have all the potentials to do so. The ruling castes are manipulating EVMs to make sure victory to them depriving the dipressed classes to enable them to acquire the MASTER KEY that can unlock all doors of progress to the entire people. If open source voting systems have real advantages compared to closed and disclosed source voting systems, then they should appear in the market much in the way that open source solutions have gained a substantial market presence in other areas of information technology. In this section, we review past and existing efforts to produce an open source voting system and then examine which types of existing open source business models might translate to the voting systems market. There have been a number of efforts to write open source voting code.69Most exist purely in software form, but three systems are used or aim to be used in actual elections: Australia’s eVACS, The Open Voting Consortium (OVC) and Open Voting Solutions (OVS). Among international efforts,70 The Australian Capital Territory Legislative Assembly commissioned an electronic voting system in 2000 to be used in the 2001 assembly election.71The winning bid, from an Australian firm called Software Improvements, was chosen on the grounds of superior project and quality management as well as increased transparency, as their solution would be freely licensed under the GNU GPL license. Software Improvements designed eVACS to be used on regular PCs that were used during the rest of the year for other purposes. Aside from the fact that it was the first officially commissioned open source voting system, there are other interesting aspects of the eVACs system. First, while being a GPL’d product, it was not a product of an open source development model; software engineers employed by Software Improvements conducted all development in a highly controlled contribution environment. In fact, when a bug was discovered in the code by outside researchers and brought to the attention of the vendor firm, they developed their own internal fix instead of accepting the outside researchers’ fix.72Second, the GPL was abandoned for the latest version of the system due to concerns of inadequate Australian legal footing73 as well as a desire of the firm to protect their intellectual property.74However, ACT Electoral Commissioner Philip Greene has said that any future work will have to support the same level of access as what Software Improvements provided with eVACS.75Software Improvements is currently in the process of designing a licensing model that would simultaneously solve their concerns while allowing third-party examination and evaluation of the code. Two groups, The Open Voting Consortium (OVC) and Open Voting Solutions (OVS) have emerged in the U.S. that aim to design or build voting systems with software source code distributed under an open source license. OVS is very new and seems still in the coordination phase of their work but has as its mission to “develop open public specification based voting systems. '’ The OVC, a loose-knit group of activists, information technology professionals and academics, produced a prototype system in 2003 that consisted of demonstration software that ran on commodity computers running the Linux operating system. The OVC’s mission now appears to have shifted toward advocacy for the use of open source code in electronic voting systems and away from the production of an electronic voting system. Given the interest in electronic voting systems powered by open source software it is notable that no working models have fully matured in the current market. I discuss some of the potential reasons for this in Section below. While the verdict is certainly not in on whether the market will independently yield open source powered voting systems, it might now be appropriate to think about other ways of incentivizing open source development so that groups like the OVC can attract the resources needed to produce marketable products. We discuss some possible ideas for this in Section . businesses can establish themselves online. You get to be creative every day. Your work can help your clients create a unified brand for their business. You can expand your business by offering related services, such as blog customization and setup. You can create partnerships with copywriters, SEO experts, web developers, marketing consultants, etc. You can provide ongoing web maintenance to create a steady income. You must be knowledgeable in all of the coding standards and technology. You need experience and to be knowledgeable about the industry. Ongoing training and software can be expensive. It can be challenging to come up with unique and creative designs. You will be tied to your computer every day. You have to extensively test every site you design on different computers and browsers. There is a lot of competition, especially from template-driven services. It can be challenging to sell ongoing website maintenance. Ime kho panàyasmanto cattàro pàñidesanãyà dhammà uddesaü àgacchanti. dhammaü àpajjiü, asappàyaü, pàñidesanãyaü, taü pañidesemãû-ti. ajjhàràme sahatthà pañiggahetvà agilàno khàdeyya và bhu¤jeyya và. Uddiññhà kho àyasmanto cattàro pàñidesanãyà dhammà.